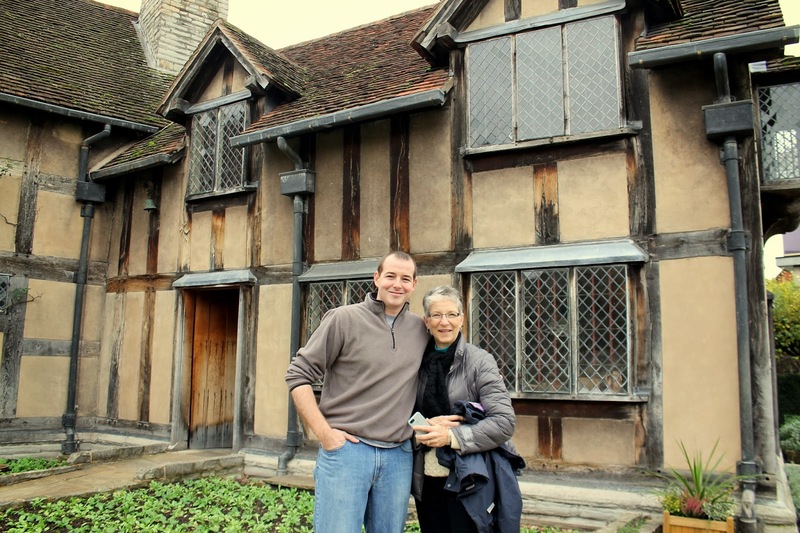 When my mother-in-law came to visit this week, I had planned a day trip to Stratford-upon-Avon. Our conversation in the car on the way there consisted of the three adults naming every Shakespeare work we've read. It had been at least 15 years since any of us had read anything, and almost everything we had was forced upon us by a well-meaning high school or college English teacher. We could count the total number on our hands. The conversation was interrupted with questions like, "Where are we going again? Is there a playground? What's a play?," from 4-year-old Big Arrow. Oh dear. So I was beginning to worry that perhaps we weren't the right group of people to be spending a day in Stratford-upon-Avon. But just like the twists and turns in a Shakespeare play, we had a wonderful day there. I knew the moment I saw the pedestrian streets lined with cute shops and cafes, Christmas lights strung overhead, that the adults would enjoy the day even if we were a little rusty on our 'where art thou's.' But I was pretty shocked that it was my young children I was forcing in the car to head home by mid-afternoon. It does take a bit of know-how to ensure every member of the family has a good time, though, so here are my tips for visiting Stratford-upon-Avon with young children. Start at Shakespeare's Birthplace. You need to give yourself a frame of reference for the rest of the sites you'll see, and this place will give you the important highlights in a condensed manner. While it's actually not the most kid-friendly of the Shakespeare attractions in town, you can easily tour the home in less than an hour. The visit begins with a few video snippets that were cartoon-ish enough to please both boys. And my 4-year-old was pretty entertained by the home itself (which features actors and historians to explain the various rooms). You're never more than a few feet away from an exit to Shakespeare's garden if anyone needs to step out and run around. 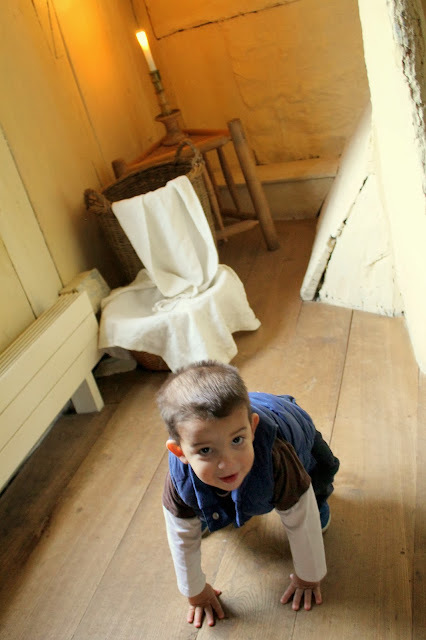 Finding a nook to play in Shakespeare's bedroom. From Quickly's, walk to Nash's House. This was the boys' favorite, although not because of its noteworthiness as a Shakespeare family home. 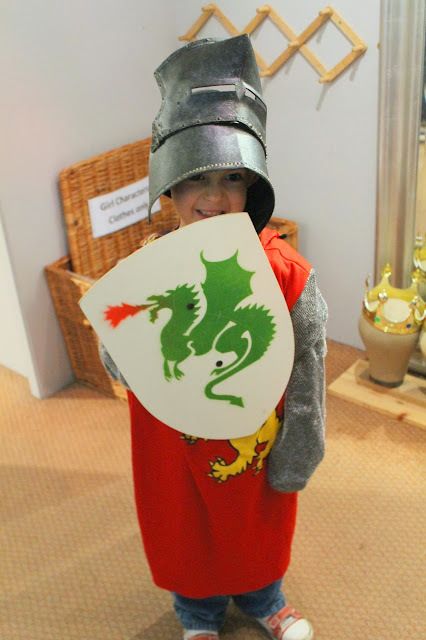 For them, the nice selection of dress-up clothes and a small children's room where they could color or play little games from that period in history were all the entertainment they needed. The gardens at this house were particularly charming and well maintained. We gave the kids another sightseeing break after Nash's House by walking along the River Avon. 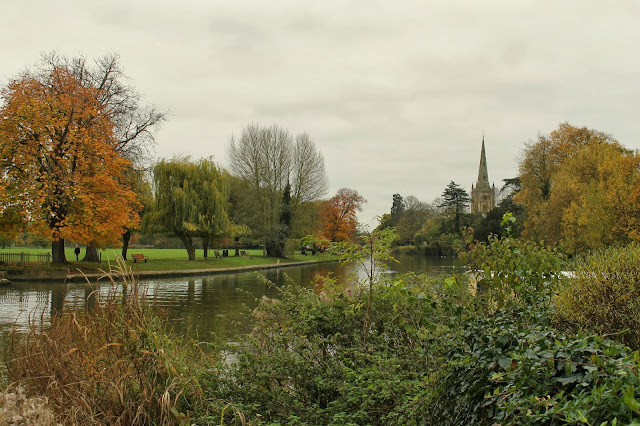 It's got a lovely walking path and gives you a beautiful view of Holy Trinity Church up ahead. Don't fear Holy Trinity Church. It seemed only fitting to end our day in Stratford-upon-Avon by visiting Shakespeare's grave inside the church. 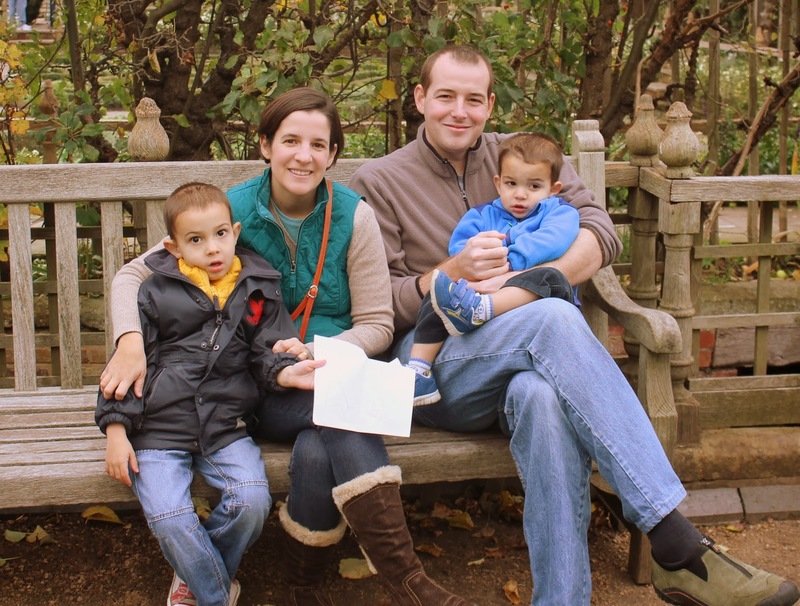 But my husband volunteered to stay outside with the boys, who were pretty lively by that point. However, when I got inside I realized there was a small children's area in the back of the church (again containing dress clothes and coloring supplies) which would easily have kept the kids busy for the few minutes we were in the church. After Holy Trinity, we headed back to our car and stopped for ice cream. Everyone had earned a treat, both for good behavior and lots of walking. Ask what's fun for kids to do. Fortunately, the staff at each attraction we visited pointed out what the children might like upon our entrance. But feel free to ask if no one volunteers that information. Take advantage of outdoor space. Each house and property has a garden. Make the most of it and let the kids run around. He's ready to give you a tour of the Nash House gardens. There's an adventure playground (just south of the River Avon on Swan's Nest Lane). We didn't need to stop there as the boys were having plenty of fun, but it's always nice to know where one is. Bring a stroller. The boys took turns riding in a small umbrella stroller. I was glad we brought it, as there was a lot of walking between attractions. But kids age 4+ would be fine without one. When I stepped into the Visitor's Center to grab a map, I picked up a brochure to a kid-focused amusement park in the area. I wondered to myself if maybe, instead of dragging them to one historical attraction after another around Europe, that we should be doing that type of activity. 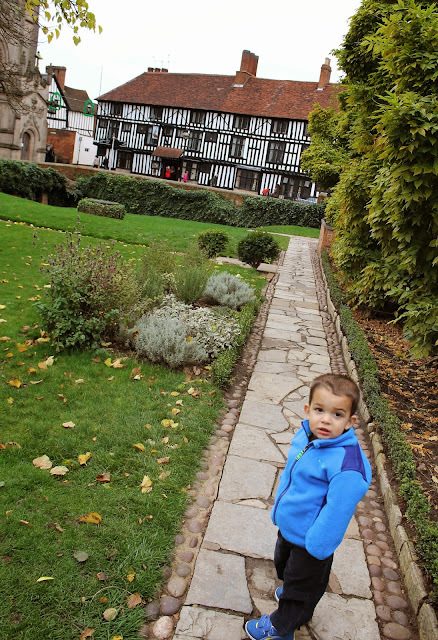 Certainly, there's a place for outings like that, too, but I'm so glad we choose to spend much of our leisure time introducing places like Stratford-upon-Avon to our kids (and ourselves). As Shakespeare said, "Like as the waves make towards the pebbl'd shore, so do our minutes, hasten to their end." Despite their young age, and maybe because of it, I'll savor memories made learning history and seeing beautiful places with my children. Disclosure: My family received a complimentary press pass to the various Shakespeare properties. All opinions are my own. Happy 2nd Birthday, Little Arrow!